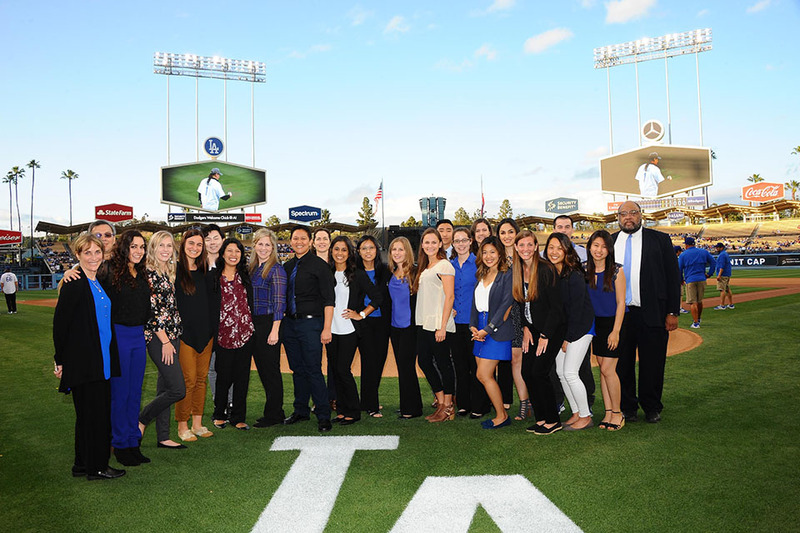 Twenty CSUN students , along with Joni Campanella-Roan and College of Health and Human Development Dean Farrell Webb pose for a photo on the grass at Dodger Stadium. Photo by Juan Ocampo/Los Angeles Dodgers. Growing up a few miles outside of Dodger Stadium, second-year California State University, Northridge physical therapy student James Choe spent many memorable days cheering on the Los Angeles Dodgers from the stands. On April 18, Choe achieved a childhood dream when he was one of 20 CSUN physical therapy students in the renowned doctorate program honored at Dodger Stadium. These students were recognized for being recipients of the prestigious Roy and Roxie Campanella Scholarship. The scholarship is provided by the Los Angeles Dodgers Foundation and the Roy and Roxie Campanella Foundation every year to CSUN students in the Department of Physical Therapy. The students walked on the field before the Dodgers played the Colorado Rockies and stood in front of loud cheers from more than 37,000 fans as an announcer listed off each of their names to the crowd. Dodger legend Roy Campanella was injured in a car accident in 1958 that left him paralyzed from the neck down. After moving to the West Coast, he settled in the San Fernando Valley to pursue a second career in community relations for the Dodger organization. He also spent time mentoring young catchers during Spring Training for the Dodgers. He sought out physical therapy treatments to help him with his condition, which eventually led to his Campanella Foundation funding scholarships for physical therapy students. Through the partnership between the Campanella Foundation and the Los Angeles Dodgers Foundation the number of recipients has grown by five every year since 2015, and is expected to grow to 25 by the fall. Campanella-Roan credited the increase to the success of CSUN’s physical therapy program. For honoree Catherine Soliva, the scholarship validated that her hard work throughout school has paid off. On top of the 20 scholarships provided to CSUN students, the Dodgers select one student from the program each year to intern with the team for eight weeks during Spring Training. This year’s intern, Ryan Yoshida, said the experience was incredible and extremely beneficial. Sharing in the students’ appreciation of the Roy and Roxie Campanella scholarship was College of Health and Human Development Dean Farrell Webb.